We visited some really cool places at the edges of the day and felt very relaxed the whole time. Tracy was so very supportive of my taking pictures, the kind of support that you can only get from a great wife. I did my best to not take advantage of it by trying not to linger too long and taking everything without setting up a tripod. I also happened to get some great pictures. Photos that I feel are some of the best that I've taken to-date. This trip proved to myself that I'm technically skilled enough that I can pretty much go anywhere and come back with a great photo. I still feel there's something missing though. I'm struggling with my own work. I know it's the best I've ever done, but when I look at others of similar skill level I still feel lacking. I don't know if it's just that I cannot judge my own work or if there is something to these feelings. I'm still exploring this and seeking out trusted opinions. In the meantime I'm going to print some samples and see what looks the best so I can hang a few larger prints. This is an easy one because this lighthouse is so popular. We came here somewhat on a whim and arrived very late. Within minutes of arriving we heard the announcement that the park was closing. But I grabbed a few quick "snaps" in the fading light. The lead image (top) is the nicest one I got from that evening. I also had a chance to do something I really enjoyed. There was a couple with their young daughter there, and the mom was taking a shot of her daughter with dad using a DSLR. I offered to take a shot of all three of them and was happy to see she had a 50mm lens on the camera. So after a minute or two of figuring out how to dial in some manual settings (it was a Canon and I shoot Nikon) we were ready to go. I was able to take a few photos in some gorgeous light that I hope they treasure forever. They were really happy to have someone there to capture this memory. It made me feel really good to use all this knowledge to do something nice for someone. We came back on a different day in the morning for a totally awesome and different feel. I love fog! It's moody, not common for most of the world, and it filters out a lot of distracting crap making composition a little easier. Here are a few fog shots. 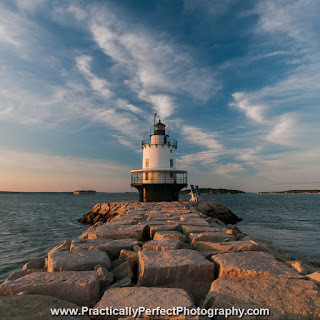 After picking up some awesome bagels from Scratch Baking Co. (bagels so awesome we've considered taking a 2 hour drive with the kids back here to get them again), we decided to stop at a different lighthouse to eat and maybe get some morning pictures. 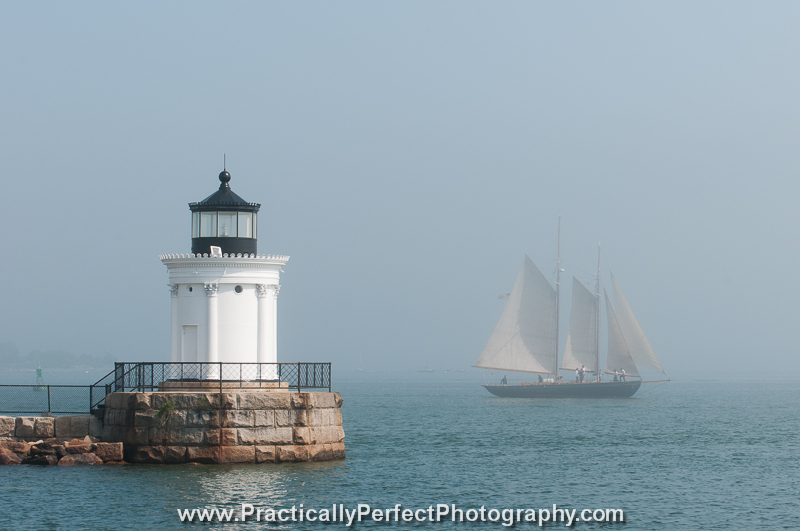 It started clear and we enjoyed breakfast, but then the fog rolled in and so did this nice sailboat. I managed to get them both in the same shot with fog and nice morning light. Time of day makes all the difference in the world in photography. How do you find things to do in Portland Maine? How about opening google maps and searching for keywords like "fort", "lighthouse", "historical", "park", and "brewery"? Yup, that works! That coupled with Trip Advisor netted us a ton of stuff to do. 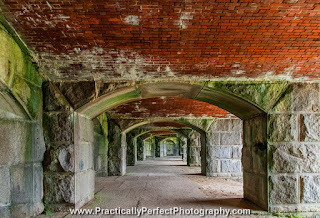 There are a lot of old forts up and down the New England sea coast. From colonial to WWII. Not all of them are still standing though, so just because you see a fort listed on a map doesn't mean there's anything there. That's why you look at the pictures (google image search). 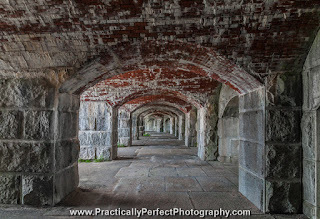 Fort Popham is a 2 story fort that is open to the public. 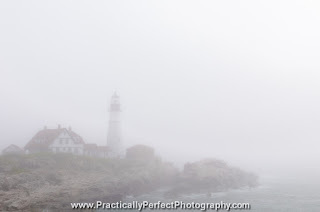 It was another misty morning, but I found the inside of the fort to be the most interesting. Contrasts of light and dark, subdued colors, and repeating patterns. 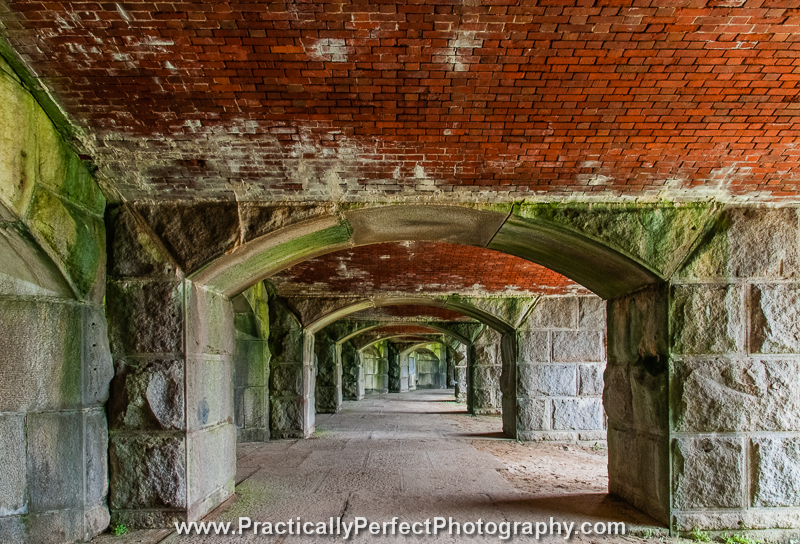 Exploring the fort was very fun, just watch out for the Mosquitos hiding in the cooler shadows. There are a lot of places like this in and around Portland, so I wished I had put a flashlight in my camera bag. We ended up using Tracy's phone as a light, but a more powerful flashlight would have been much easier. On another evening we decided we wanted to be at a lighthouse for sunset. 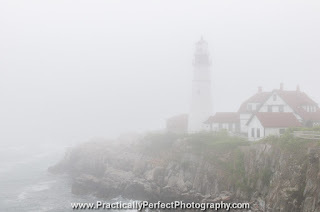 First we tried Twin Light State Park. Upon arriving at the park entrance we immediately saw the signs that not only was there an entrance fee, but that "There are no lighthouses here". OK, totally misleading name. There were however lighthouses nearby. The parking lot there was tiny and already full, but we had already driven here and it was close to sunset. After cruising up and down the road countless times a parking spot finally opened up. We wandered around a bit and did see at least one lighthouse but couldn't spot the other (perhaps it was a bit offshore). 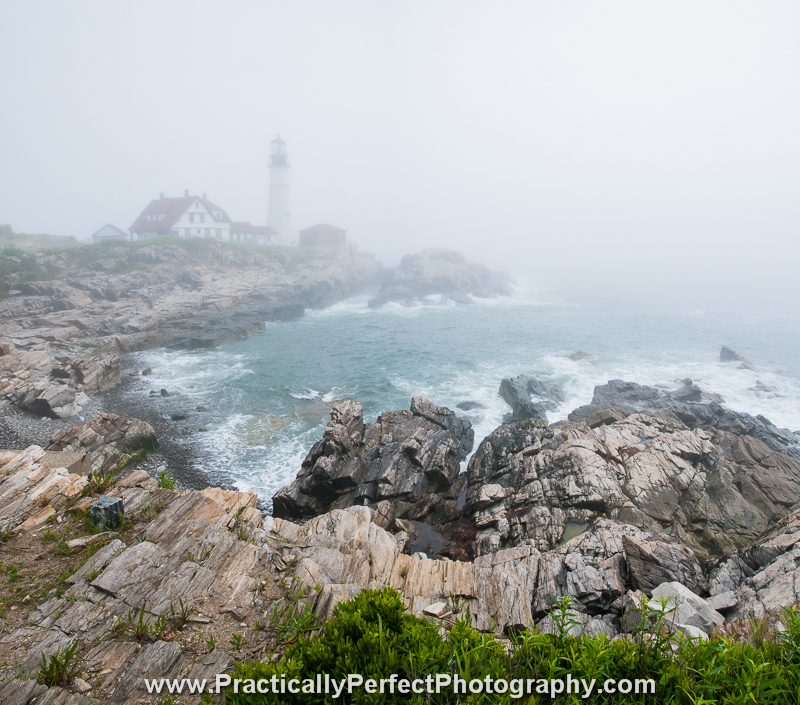 Either way we felt this place was kind of a dud, so we decided to take our chances trying to finding Spring Point Ledge Light. We were running out of daylight, so I was concerned about missing the good light. When we arrived the sun was still shining, and in reality I think there was a lot more daylight left than I assumed. Things really came together when ALL of the people who were already out on the jetty started to leave when we got out there. I was able to get many clear shots the way I wanted them (without a significant human element). The sky was so cool looking that I decided to put on the polarizer, and to me that really enhanced the colors and texture. I was losing a stop of light and having to boost ISO to compensate, but it worked out (albeit with a little more noise at the pixel level). An interesting thing here was that I tried two different compositions from the same position with all the same settings. One emphasized the jetty, the other the sky. At the time I thought I would have to pick between the two. It wasn't until later in this trip that I decided to try taking pictures with a plan to stitch them together later (after all, I can't really afford an ultra wide lens right now, and wide angle perspective has nothing to do with how many mm are on your lens). Turns out I didn't have to pick between them after all. I was able to stitch them together beautifully and now I'm free to crop or not. Right now I'm liking the 1:1 ratio, so I might just stick with that. We visited some other places too, but none of the photos I took there were spectacular. We spent time downtown sampling beers and eating gelato. We stopped by The Desert of Maine. We visited the Portland Museum of Art and the enormous LL Bean store. 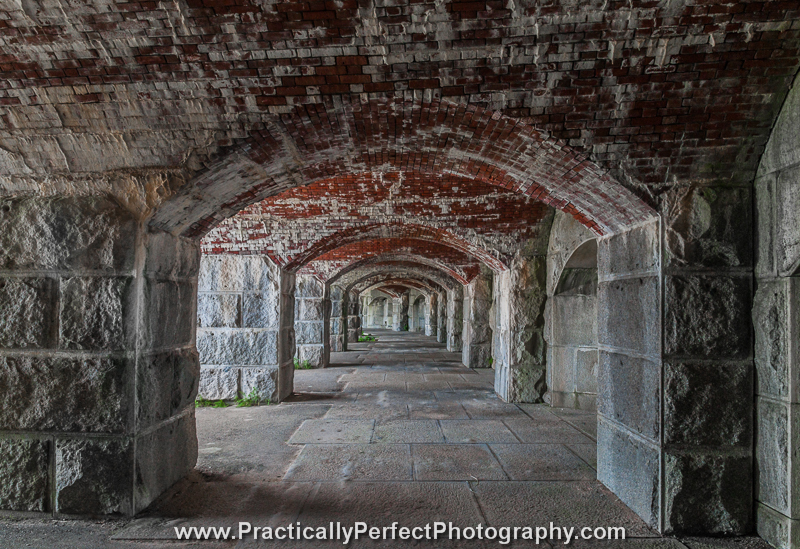 We also took a half day trip out to Peaks Island (which also has an amazing fort). The trip was lots of fun with the best company imaginable. I also happen to get some great pictures with minimal effort, especially for a non-photographic trip. Next time I go I will definitely pack a flashlight, I had no idea the extent of old explore-able forts that can be found along the coast. It's always a good idea to pack a small, but powerful, flashlight in your camera bag for any trip. 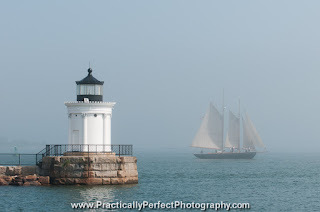 Have you ever been to Portland Maine? What did you think? 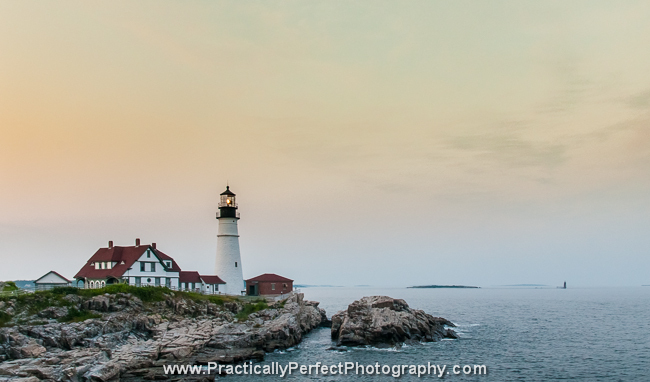 Ever shot lighthouses before? Let me know in the comments.